MGI says the new “Quad Series” represents a stunning new pinnacle for the Australian company, which is arguably one of the biggest motorised golf buggy brands in the world. In fact, this year the company has been celebrating 21 years of operation and to mark the milestone has undergone something of a major makeover with a new compass logo, new corporate colours – and of course this new stylish and innovative Quad Series range. 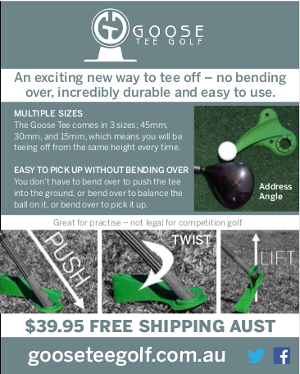 MGI was founded in 1993 by Ian Edwards, who after a lifelong passion for sport saw an opportunity in the Australian market. “I created a buggy built for the harsh Australian conditions and took the best features from various buggies built for other countries to create the ultimate buggy under the MGI brand,” Edwards says. He designed MGI buggies to be robust, reliable and powerful for our various terrains. “In Australia we tend to play golf all year round and overseas it tends to be more seasonal so we needed a golf buggy that could adapt to our four seasons. This included standard features such as a seat to rest on for summer, an umbrella holder and water-resistance for winter and autumn. 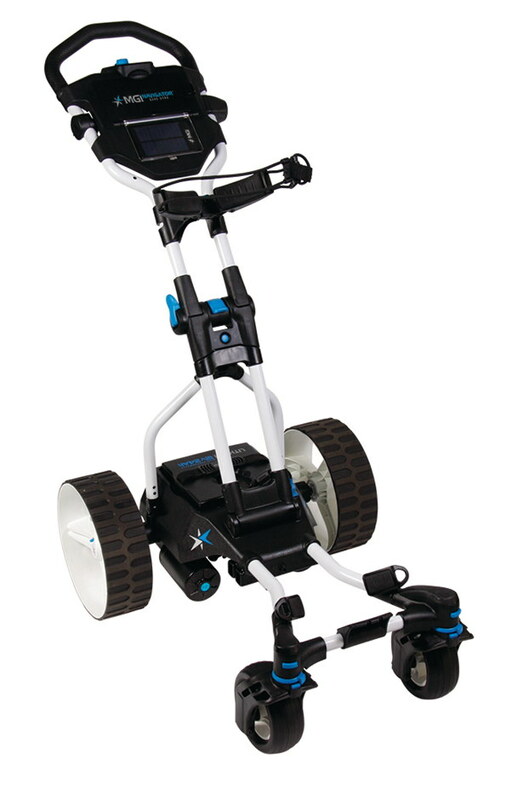 As well as an integrated solar charging compartment to enjoy a full spring day on the course and with the one piece compact frame for easy transport and travel, golfers will be able to enjoy travelling to their favourite golf course any season,” he says. The new Quad Series range includes the entry level MGI Hunter Quad, the MGI Coaster Quad Brake with a number of additional features and the top of the range MGI Navigator Quad Gyro. MGI says the Quad Series is a reflection of what golfers demand from their “caddy” – power, performance, style and innovative technology. A major feature of course is the four wheel design and they are said to be the only four wheel buggies with rotating front wheels and, very importantly, suspension. 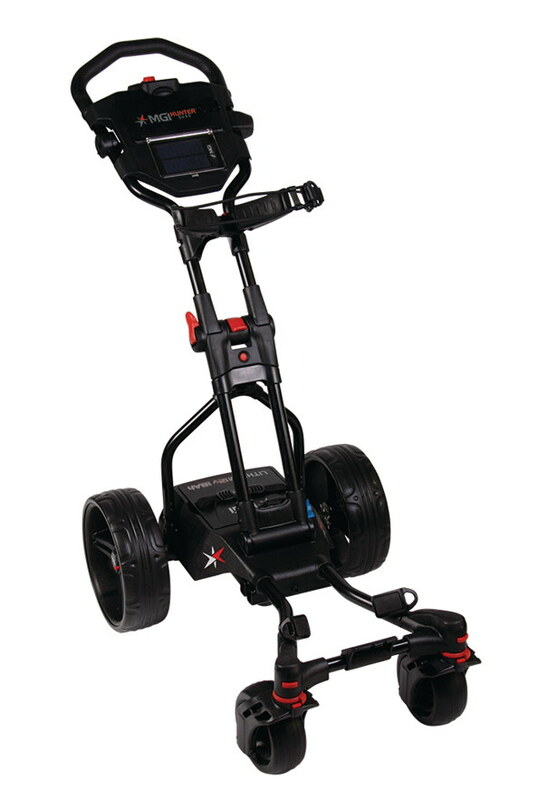 Other highlighted features include the compact size, controlled downhill speed braking system, electronic park brakes, patented gyroscope directional technology and multi-functional utility handle. The new compact size is the shortest and most compact motorised golf buggy designed in MGI’s 21 years of operation. The Quad range take 22 percent less space than previous models. The four wheel design provides stability, better manoeuvrability, weight distribution (increasing the life of the buggy) and a smooth ride with less resistance. While the rotating front wheels and front wheel suspension provide a noticeably smoother ride and a more pleasurable walk. You can also experience the “weightlessness” with the controlled downhill speed braking system integrated in the MGI Coaster Quad Brake and MGI Navigator Quad Gyro. Plus the MGI Coaster Quad Brake features the new Electronic Park Brake – stop on any steep incline and at the press of button, the Coaster will lock and not creep forward. The fresh new design includes the new colours, frame and form of the frame. The new MGI logo changes colour to represent the buggy specifically with the compass point changing to tangelo for the Hunter Quad; green for the Coaster Quad Brake; and blue for the Navigator Quad Gyro. The new multi-functional utility handle allows more easy access storage for your everyday needs as well housing the integrated technology at the heart of the motorised buggy. Now you can travel anywhere and charge any device via the multi-functional utility handle. The new built-in GPS holder (also easily removable so you can walk with your mobile GPS to your ball) allows for any mobile device such as a Sureshotgps or mobile phone (so you can watch your golf mapping App). It is also compatible with the Sureshotgps SS Solar Panel Pack to provide an in-built solar panel charge so you can charge your mobile devices whilst on the course. The utility handle is also adjustable to any height and includes a scorecard holder and storage. The MGI Hunter Quad is the entry level model but provides all the features you would need to stay focussed and relaxed to play your best game of golf ever. It is powerful yet quiet and simple to use. With signature MGI features including compact one piece frame and controlled distance function, and an array of standards including seat, umbrella holder and sand bucklet loop, you’ll always be in good company with the MGI Hunter Quad. Tame the terrain with the MGI Coaster Quad Brake thanks to the controlled downhill speed braking system and park brake. The Coaster conveniently stops on command using the control distance function which can be set 5 to 60 metres and will stop at your desired distance. 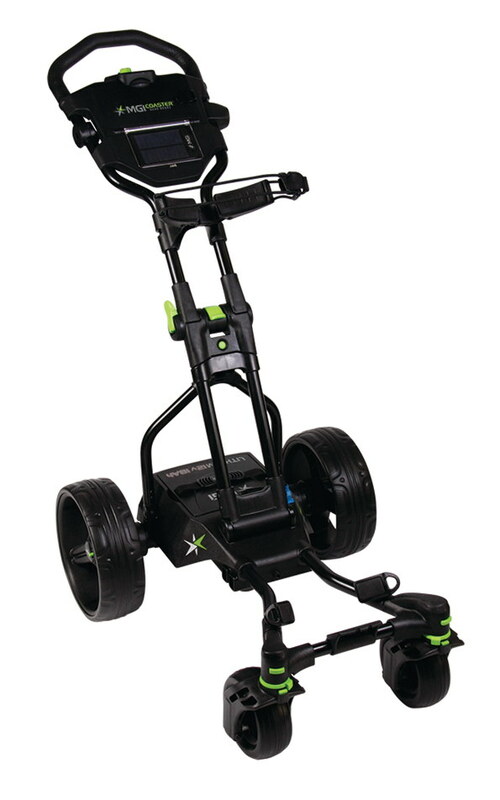 A must for moderate to hilly courses, the Coaster also features the new Electronic Park Brake. Play on any steep incline and at the press of a button activate the Electronic Park brake for an absolute stop on any terrain. True control and power is in your hands with the MGI Coaster Quad Brake. The MGI Navigator Quad Gyro will be your new best friend on the golf course and is dynamic on every level. It is the pinnacle of luxury and power with intelligence to stay on track and respond to your needs on the course. The patented gyroscope technology helps master any terrain by keeping the buggy straight on track irrespective of the terrain (it can literally move across a hill instead of down). With a full directional remote control you can direct your buggy from a distance and have more energy to play your best game. Battery choice matters so choosing the right battery to suit where you play and how often is important. With the Quad Series you have the choice between a lithium or SLA battery for your new buggy. The Navigator Quad Gyro comes standard with the lithium 12v 24amp battery and you can select your preference for the Hunter Quad and Coaster Quad Brake (four options with different RRPs). As MGI are environmentally conscious where possible they recommend lithium batteries as they are eco-friendly due to being more efficient and lightweight which means they require fewer replacements, meaning fewer batteries in landfill and an increased buggy lifetime with less wear and tear on the gear box. Standard accessories with every buggy include padded seat with storage, fully adjustable deluxe umbrella holder and a sand bucket loop. To complement your new buggy, MGI has introduced ten new and updated accessories including a new cooler storage bag which is fully insulated and easily attaches to the Quad buggy. Another new addition is the winter wheels, specially designed with rubber tread for hilly courses and wet conditions. The scorecard holder has been re-designed to take all size scorecards including the newest electronic style. Plus MGI has kept the favourite accessories like the umbrella holder extension, drink holder and travel bag. MGI is committed to providing support for life and has the largest network of service centres as well as onsite mobile servicing in Sydney and Melbourne metro areas to ensure your buggy keeps up with you in impeccable condition. Sorry to hear you have been having issues. We will let MGI know about your comments and hopefully they will get back to you soon. I’m purchasing a new MGI Navigator Quad buggy, I would like to know the difference of the normal set of wheels the buggy comes with compared to the winter wheels. Also can I order the winter wheels instead of the normal wheels? The other question is that I would like to purchase a rain cover for my MGI Quad but will it fit around a Titleist 10 1/2″ staff bag?? Will pass your questions on to MGI and ask them to reply to you directly. We received the following answer from MGI to your questions. Hope it helps your decision. “The difference in the normal wheels and the winter wheels is that the winter wheels has a much lower profile “tyre” or rubber as well as a thicker tread pattern thus making it a more desirable wheel to use in winter or on wet and hilly courses where a bit more grip is needed. You cannot order the winter wheels on their own. They are an optional accessory. I recently purchased a new MGI Navigator Quad, but suddenly now it just starts up by itself, even if the button is off, and the remote is off and locked? I’ll pass your comment on to MGI and see what they come up with. With my own electric buggy I just charge the battery overnight before I need it. Bonjour, je viens d’acheter un buggy MGI Coaster Quad Brake, j’aimerais avoir un manuel d’instruction en français. I have an MGI Terrain Tri-Brake golf buggy & recently my husband removed the wheels when packing the car for a w/e away. Since then, the wheels spin or there is a period of hesitation before taking off. On occasion, I turn off the buggy, then restart it. I know there are a couple of sites on the wheel shaft (I think) where the wheel clicks into it. Is the wheel in the wrong one? I would be grateful for your reply. I have searched for a manual at home, but I don’t seem to have one and online information has not covered my problem. I’d give the experts at MGI a call and ask them. Phone number for support is Phone: (03) 8872 6700.